Major D.P. Singh is a retired officer of the Indian Army. 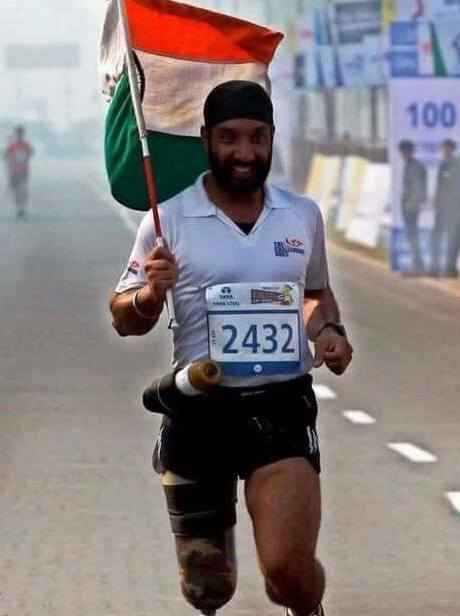 He is a Kargil War veteran and is known as the India's first blade runner. He got injured in the war and his right leg was amputated. After his amputation, he gradually started running using a prosthetic limb and has run in 18 marathons in his running career. The Limca Book of Records added his name to their "People of the Year 2016" list. In this article we shall have a brief look on his life and his contributions to the country. Devender Pal Singh was born on 13 September 1973 in Jagadhari, India. He received his senior secondary education from Kendriya Vidyalaya Roorkee. He did his bachelor of arts degree from CCU Meerut and PGDBM from Rani Jhansi University, Jabalpur. He is very jolly in nature and can be seen smiling passionately in most of his pictures. He believes that playing sports is solution to most of the life's problems. He can be seen in News channel debates and has given many inspirational speeches. He has 4 Limca records under his belt. He is also very active on social media and also has his own website. He also runs an NGO by the name of The Challenging Ones to help physically challenged people. Major Singh graduated from the Indian Military Academy (101st course, Regular batch) on 6 December 1997 and was commissioned into the 7th Battalion, The Dogra Regiment. Major D.P. Singh was injured on 15 July 1999 at LOC in Akhnoor sector while fighting for India during the Kargil War (Operation Vijay). He was 80 meters from a Pakistani Army post when a mortar fell within 1.5 metre of where he was. The shrapnel injured multiple parts of his body. His intestines were damaged and a part of his right leg was amputated as it had developed gangrene. He was "Declared Dead" when first brought into an Army Hospital. It was by a stroke of luck that one doctor who was present on the spot refused to give up on him and managed to resuscitate him. After He eventually survived, and underwent several surgeries, but his leg had to be amputated. After the injury, in 2002, he converted to Army Ordnance Corps. He retired from the Indian Army in 2007, after serving for 10 years. He had to learn how to stand, how to walk and how to run. He started playing different sports in order to inspire people. He stated with golf, then moved on to squash and then eventually to marathon running. He started his running career with Delhi Half Marathon 2009. He completed the 21 km run in 3 hours and 40 minutes. He is nicknamed as "India's first blade runner". MUST WATCH : Major DP Singh's inpiring Ted talk in which he talks about his life.